Some months ago, Nokia backed out of supporting MeeGo, its big partnership with Intel to create an open source smartphone operating system (based on Intel processing architecture, of course). Things looked bleak for MeeGo, even after Nokia released its lone MeeGo device, the N9. Today, the MeeGo project has been canceled, according to its blog. From its ashes, however, a new smartphone OS is rising: Tizen, a new collaboration between Intel and Samsung. Tizen will also be open source, hosted by The Linux Foundation, and support HTML5-based applications as well as other Web standards. 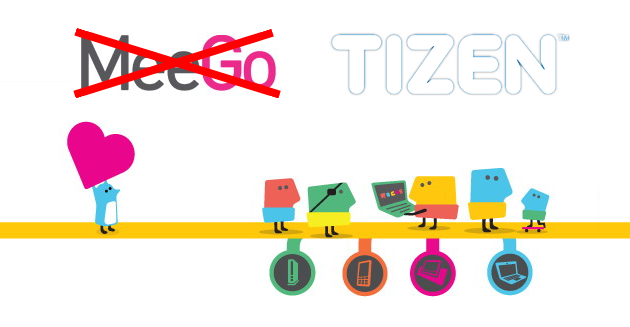 The move makes some sense for both parties and for MeeGo, whose code is no doubt being plundered and put at the heart of Tizen, which is currently slated for release as soon as the first quarter of 2012. Intel is currently completely shut out of the exploding smartphone and tablet world, which relies on open ARM processors that are more battery friendly. If it hopes to stay relevant, it must correct its series of failures in this market and find success. On the other hand, Samsung is currently the number two phone maker in the entire world and seems to be getting nervous about its unilateral support of Android now that Google is buying Motorola. The Korean manufacturer already supports Windows Phone and is beefing up development on its homegrown Bada OS to look and feel more like a modern smartphone platform. Some rumors pegged it as interested in developing for or purchasing HP’s WebOS platform as well, though Samsung executives have ruled this out. It’s becoming quite clear that Samsung is okay with Android, but doesn’t want to be left in the cold should things go sour for the OS. It is currently taking a lot of heat from Apple. Tizen has a difficult road ahead of it. 2011 has already seen the death of WebOS and likely BlackBerry’s Tablet OS as well, which is based on QNX. More and more, consumers and manufacturers are heading toward Apple’s iOS and Google’s Android OS (another open source Linux project) as the market leaders. Even Microsoft’s sleek Windows Phone OS has actually lost market share in the last year as has everything RIM has to offer. Could a new Linux-based smartphone platform edge out Android? Tizen will work on smartphones, tablets, netbooks, in-vehicle dashboards, and smart TVs.